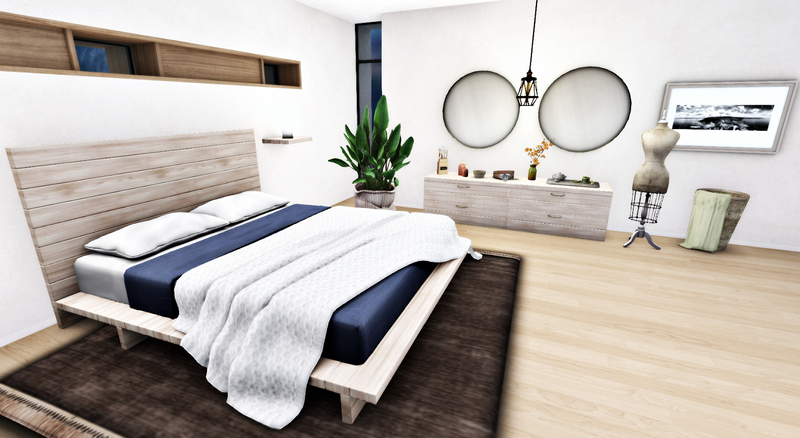 I put together a calming bedroom with items found at this round of Boardwalk. I love the Boardwalk event due to all the great designers. You can refresh your home every round with items from this event. For the home I used the Maven Homes Palomar which I mentioned in a previous post. This home has large rooms that are great for decorating while not being cramped. Plus it has a big view window. Now on to the decor. In this bedroom I used the Carriveau Bedroom Set by DIGS. It comes with the Bed, a tall wardrobe (not pictured), chest drawers, mirror, shelves and candles. I used assorted items to decorate the top of the dresser including pearl box, small basket and laundry basket from Magnum Opus new release The Linen Cabinet (not picture the cabinet, wash clothes and hanging towels). I also placed a hanging light and flowers from Dreaming Leaf Studios at the SL Home and Garden Expo that benefits Relay for Life in Second Life. I also included a photo titled Fort la Latte Panorama by Jarrod Beck which is a nice black and white print. Across the large room I have a reading nook to help with my calm. I do love to read in RL so SL should be no different. My book nook has the new fat pack called Poster Books and Shelves in Light by Ellas. This set includes the bench, ladder with book shelves, bunny photos, pillows and books w/coffee. I also used the Poster Glass Divider to complement my swing by Raindale.